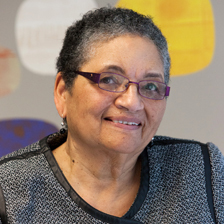 Fran Jemmott is a leader and change agent for social justice. Her work has focused on reducing health disparities and social determinants of health as a donor, grantmaker, board member, executive director, policy advisor, and volunteer. Before founding the Jemmott Rollins Group in 2002, she served as program director for Community and Women’s Health at The California Wellness Foundation. For 12 years, she served on the board of directors of the Liberty Hill Foundation on key committees, including strategic planning, board development, and Uplifting Change – their signature effort to generate and direct funds for social justice issues in communities of color. She also founded the California Black Women’s Health Project in 1994 along with other pioneers for women’s health advocacy. As founder and CEO of the Jemmott Rollins Group, Fran leads the firm’s work in strategic planning, fund development, and program planning. She serves as a thought partner to private and corporate companies, as well as community foundations, to improve organizational effectiveness through greater cultural awareness, competence, and sensitivity.